The genus Amphibacillus was established in 1990, and seven additional species were described in the past two decades. 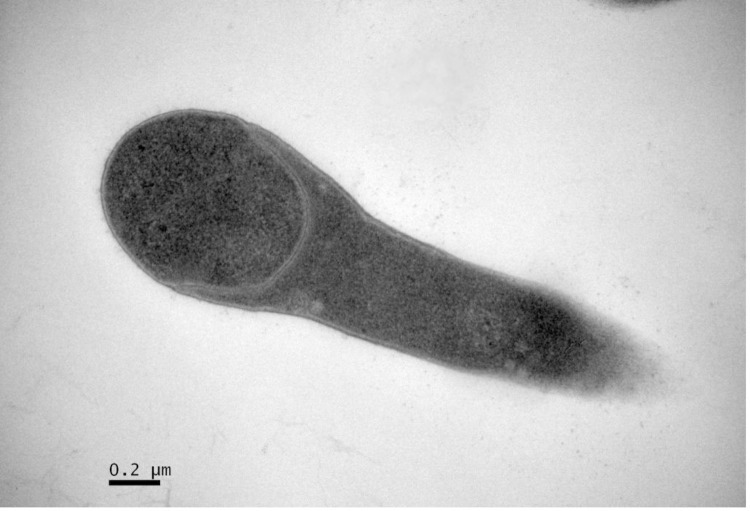 Amphibacillus jilinensis Y1T is a facultatively anaerobic and alkaliphilic bacterium isolated from a soda lake in China. Here we describe the structural and genetic features of the draft genome about the type strain Y1T (3,831,075 bp, with a G+C content of 37.27%). This is the first genome report of the Amphibacillus genus. The genus Amphibacillus belongs to the family Bacillaceae and was established in 1990 . Currently the genus comprises eight validly published species: A. xylanus , A. indicireducens , A. cookii , A. marinus , A. jilinensis , A. sediminis , A. fermentum and A. tropicus . All are Gram-positive, moderately alkaliphilic, facultatively anaerobic rods [5,6]. All can grow at pH 9.0 and one can grow at pH 12.0 [2-4,6]. 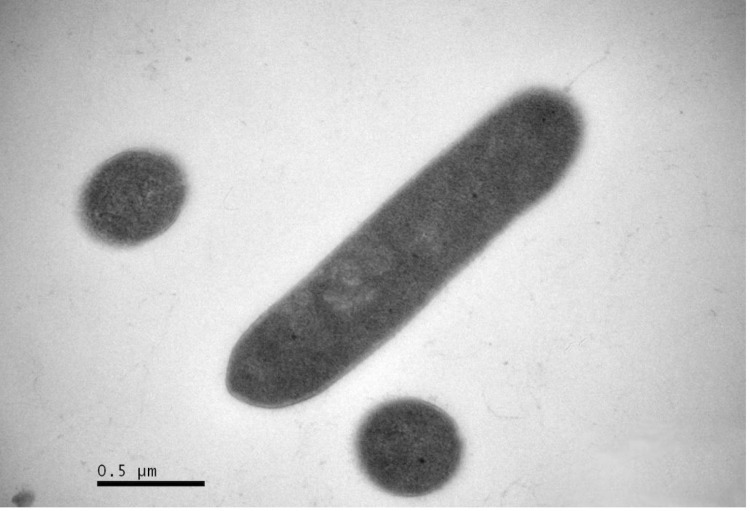 Amphibacillus jilinensis Y1T (=CGMCC 1.5123T =JCM 16149T) was isolated from a soda lake in Jilin province, China, and grows at pH range from 7.5 to 10.5 with an optimum at 9.0 . Strain Y1T can utilize a large spectrum of substrates as sources of carbon and energy, can grow both aerobically and anaerobically, and tolerate Na+ up to 2.8 M. In this genus, three species have been sequenced. A finished genome sequence is Amphibacillus xylanus NBRC 15112 (NCBI Accession Number AP012050) and two incomplete sequences are A. jilinensis Y1T (NCBI Accession Number AMWI00000000) and Amphibacillus sediminis Shu-P-Ggiii25-2 (NCBI BioProject ID PRJDB405) according to the GOLD records [8,9]. Here we report this draft genome of A. jilinensis Y1T, the first genome from genus Amphibacillus to be sequenced. A sediment sample was collected from a soda lake (44°45’N, 123°34’E) in Jilin province, China, in November 2007. There is no freshwater river to flow into the lake. Atmospheric water and groundwater are the only water sources of this lake. The lake is rich in Na+ (257.2 mg/l), CO32- (50.7 mg/l), Cl- (10.1 mg/l), HCO3- (6.5 mg/l) and SO42- (4.4 mg/l), with the pH of the water sample in the same geographical location being 10.0 . The strain Y1T was isolated from enrichment cultures of sediment sample by the Hungate roll-tube technique  under a gas phase of O2-free N2 [1,5]. Comparative 16S rRNA gene sequence analysis by BLASTN [11,12] using the NCBI-NR/NT database revealed 93.4-98.8% sequence similarity to members of the genus Amphibacillus. Neighbor-Joining phylogenetic analysis based on Tamura-Nei model indicated the taxonomic status of strain Y1T is clearly classified into the same branch with genus Amphibacillus, and the most closely related genus is Halolactibacillus (Figure 1). A. jilinensis Y1T can tolerant high salinity but can also survive without Na+. Growth occurs under either aerobic or anaerobic conditions. The optimal growth condition of strain Y1T occurs in medium JY with 0.5 M Na+ (0.06 M NaHCO3 and 0.44 M NaCl) . The optimum pH is 9.0, with a growth range of pH 7.5-10.5. No growth was observed at pH 7.0 or 11.0. Strain Y1T is mesophilic, with a temperature range of 15-45 ºC and optimum growth at 32 ºC [Table 1]. Cell morphology, motility and sporulation were examined by using transmission electron (H-600, Hitachi) microscopy. Cells of strain Y1T are straight rods with petritrichous flagella, which have a diameter ranging 0.4-0.6 µm and a length of 2.0-3.2 µm (Figure 2a). In the late-exponential and stationary phases of growth, the rods can form terminal endospores (Figure 2b). Phylogenetic tree highlighting the position of A. jilinensis strain Y1T relative to other type strains within the Amphibacillus genus and with the relative Halolactibacillus genus. The strains and their corresponding Genbank accession numbers are shown following the organism name and indicated in parentheses. Three strains have their corresponding NCBI genome project IDs and sequencing status [8,13] listed here: PRJNA42371 of A. xylanus DSM 6626T, complete; PRJNA171498 of A. jilinensis Y1T, Draft; PRJDB405 of A. sediminis Shu-P-Ggiii25-2T, in progress. The phylogenetic tree uses 16S rRNA gene sequences aligned by the CLUSTALW , and phylogenetic inferences were made using Neighbor-joining method based on Tamura-Nei model within the MEGA5 software . Numbers at the branching nodes are percentages of bootstrap values based on 1,000 replications. The scale bar indicates a 1% substitution per nucleotide position. Bacillus subtilis DSM 10T was used as an outgroup. L-arabinose, cellobiose, D-fructose, D-galactose, D-glucose, lactose, maltose, mannose, D-mannitol, melibiose, D-raffinose, rhamnose, D-sorbitol, sucrose, trehalose and D-xylose. a) Evidence codes - IDA: Inferred from Direct Assay; TAS: Traceable Author Statement (i.e., a direct report exists in the literature); NAS: Non-traceable Author Statement (i.e., not directly observed for the living, isolated sample, but based on a generally accepted property for the species, or anecdotal evidence). These evidence codes are from the Gene Ontology project [26,27]. If the evidence code is IDA, then the property should have been directly observed, for the purpose of this specific publication, for a live isolate by one of the authors, or an expert or reputable institution mentioned in the acknowledgements. Transmission electron micrograph of cells of strain Y1T, showing a longitudinal ultrathin section of a cell forming a spore. Bar: 0.2 μm (a). Transmission electron micrograph of cells of strain Y1T, showing a longitudinal ultrathin section of the peritrichous flagella in the stationary phase of growth. Bar: 0.5 μm (b). The genome of A. jilinensis was selected for next-generation sequencing on the consideration of its facultatively anaerobic characterization and as a new member in genus Amphibacillus. This is the first genome report for any of the eight Amphibacillus species. Two others are the subject of ongoing own genome projects. This Whole Genome Shotgun project of A. jilinensis was deposited at DDBJ/EMBL/GenBank under the accession AMWI00000000 and consists of 83 contigs (further assembling constructed these contigs into 30 scaffolds). Table 2 presents the project information and its association with MIGS version 2.0 compliance . A. jilinensis Y1T was cultivated aerobically in modified JY medium, which contains (per liter distilled water) 2.0 g yeast extract (Difco), 5.0 g sucrose, 0.2 g KCl, 0.2 g KH2PO4, 0.1 g MgCl2. 6H2O, 0.5 g NH4Cl, 0.1 g CaCl2, 0.06 M NaHCO3 and 0.44 M NaCl, final pH 9.0 at 32°C for 3 days . Genomic DNA was extracted using the method described by Marmur . The yield, purity and the concentration of genomic DNA was judged by the 0.7% agarose gel electrophoresis with λ-Hind III digest DNA Marker (TaKaRa, Dalian, China) and measured by the NanoDrop 1000 Spectrophotometer (Thermo Fisher Scientific Inc., USA). About 736.6 μg genomic DNA at the concentration 744 ng/μl was obtained. Genomic DNA sequencing of A. jilinensis Y1T was performed using Solexa paired-end sequencing technology (HiSeq2000 system, Illumina, Inc., USA)  with a whole-genome shotgun (WGS) strategy, with a 500 bp-span paired-end library (~500 Mb available reads, ~130-fold genome coverage) and a 2,000 bp-span paired-end library (~250 Mb available reads, ~65-fold genome coverage). All these clean reads were assembled into 83 contigs (the minimum length is 231 bp) and 30 scaffolds (the minimum length is 542 bp) using the SOAPdenovo v.1.05 [30,31,50]. The quality of the sequencing reads data was estimated by G+C content and sequencing depth correlation analysis. The tRNAs and rRNAs were identified using tRNAscan-SE , RNAmmer  and Rfam database ; The open reading frames (ORFs) and the functional annotation of translated ORFs were predicted and achieved by using the RAST server online [35,51]. Classification of some predicted genes and pathways were analyzed using COGs [36,37] and KEGG [38-40] databases. Meanwhile, we used the InterPro [41,42] to obtain the GO annotation with the database of Pfam . The draft genome sequence of A. jilinensis Y1T revealed a genome size of 3,836,603 bp (scaffold length) and a G+C content of 37.27%. These scaffolds contain 3,649 coding sequences (CDSs), 51 tRNAs (removed 3 Pseudo tRNAs) and incomplete rRNA operons (two 5 S rRNA and one 16 S rRNA). A total of 2,683 protein-coding genes (67.72%) were assigned a predicted function (Table 3) and genes have been categorized into COGs functional groups (Table 4). b) Includes 1,092 hypothetical proteins and 19 unknown functional proteins by RAST subsystem annotation. aThe total is based on the total number of genes which categorized into COGs functional groups in the annotated genome. The genomic annotation results suggest that strain Y1T can adapt to an extremely basic environments. A large number of genes related to carbohydrate metabolism can encode proteins that provide a stable energy supply to maintain the lower internal pH despite the high external pH . Several cation/proton antiporters were found in the genome, which are also crucial for the maintenance of internal pH . However, the lower number of these genes in Y1T when compared to Bacillus pseudofirmus OF4  may imply another way of importing protons into the cell. Meanwhile, as a facultatively anaerobic bacterium, 27 oxidative stress related genes are found in the predicted annotations, such as manganese superoxide dismutase (EC 1.15.1.1), superoxide dismutase [Cu-Zn] precursor (EC 1.15.1.1), organic hydroperoxide resistance transcriptional regulator and CoA-disulfide reductase (EC 1.8.1.14). For facultatively anaerobic strains, these superoxide dismutases (SODs) may be critical because the systems can help to regulate intracellular oxidative stress when the cells grow during aerobic respiration, and can also be used in the treatment of disease, study of pharmacological activity  and in the cosmetic industry. It also contains 34 two-component system genes that encode response regulators and sensor histidine kinases. The two-component systems appear to be used to respond to a wide variety of stimuli, including the presence of nutrients, antibiotics and chemoattractants in the environment, changes in osmolarity, temperature, pH, etc [47,48]. This is especially true in strain Y1T, in which these systems are thought to be used for recognizing environmental pH, and regulating its internal osmotic stress to survive various environments . According to the database Pfam , there are also 9 CRISPRs-associated (Cas) proteins or Cas protein families in this genome of A. jilinensis. Strain Y1T is the fifth member of the genus Amphibacillus to be described and is the first for which a genome sequence report is available. These data will provide a new perspective of how microorganisms adapt to anoxic and alkaline environments, and may also provide a pool of functional enzymes that work at higher pH. We thank Xiao-Yue Wu for her work in isolation and characterization of this new bacterial species and Xin-Qi Zhang for her professional advice. This work was supported by the Chinese Natural Science Foundation (grant no. 31170001) and Zhoushan Science and Technology Projects (no. 2012C33024 & no. 2011C31013). Humane R. A roll tube method for cultivation of strict anaerobes. METHODS IN MICROBIOLOGY, VOLUME 3B 1969;3:117. Kanehisa M, Araki M, Goto S, Hattori M, Hirakawa M, Itoh M, Katayama T, Kawashima S, Okuda S, Tokimatsu T. KEGG for linking genomes to life and the environment. Nucleic Acids Res 2008(36 Database):D480 - 484.